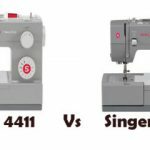 A honest and impartial comparison between two similarly priced beginners machines, the Janome 2212 and Brother CS6000i. Both are poles apart in features though. 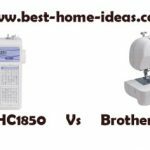 Janome 2212 and Brother CS6000i are two machines that belong to entirely different categories of sewing machines. Brother CS6000i is a fully computerized sewing machine, whereas Janome 2212 is an out and out mechanical sewing machine. Then what is in common? It is the price. Both machines come in the same price band (sometimes there is only a couple of dollars difference, it changes with shopping seasons). Similar price is the only factor that makes this comparison worth having a look, other than that, these two machines are poles apart. It will be like comparing an SUV with a hatchback, both are vehicles but their duties are different. If you compare the features, Janome 2212 simply can’t win over Brother CS6000i. Being a computerized sewing machine, you expect CS6000i to be packed with features (don’t you). Janome lovers might get embarrassed by seeing the features comparison but don’t worry, 2212 has its own merits as well. Let us have a look at the difference in features. Built-in Stitches : Brother CS6000i comes with 60 built-in stitches including 7 one-step buttonholes. Janome 2212 on the other hand has only 12 built-in stitches (indicated by the last two digits of the model number). And the Janome machine doesn’t have a one-step buttonhole, instead it comes with a single four-step buttonhole. Lack of one-step buttonhole means, beginners will find it that much more difficult to make a buttonhole. You will need to go through 4 different steps. So CS6000i is a clear winner in this section. Automatic Needle Threader : An automatic needle threader threads the needle for you, it is a huge time saver. 2212 lacks this and CS6000i has this on board. Top Drop-in Bobbin : This is a must have feature for beginners. Janome 2212 doesn’t have a top drop-in bobbin, instead it has a side loading one, which means you will have to remove the storage compartment every time you want to change the bobbin. Brother CS6000i has the top drop-in bobbin in which you just drop the bobbin in. And the clear cover on it, lets you keep an eye on the thread supply. Stitch Width And Length : CS6000i wins here with a maximum stitch width of 7mm and stitch length of 5mm. Janome 2212 on the other hand, has a maximum stitch width of 5mm and stitch length of 4mm only. Feed Dog : Brother’s 6 piece feed dog is slightly better than Janome’s 5 piece one. It is just a marginal difference. Computerized Controls : Being a computerized sewing machine CS6000i has an LCD display, sewing start/stop button and speed control slider which lets you sew without using the foot pedal. Janome 2212 has only foot pedal operation. Stitch selection is done by turning the dials. Programmable Needle Up/Down : This is a must have feature for quilters and CS6000i has it. It is vital for pivoting and quilting. Janome 2212 doesn’t have this feature. Extension Table : CS6000i comes with an included extension table which is not the case with 2212. That’s all about the features. 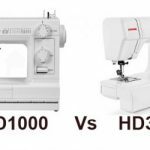 Both are high performing sewing machines. 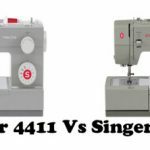 Apart from the price, both machines have another thing in common, the stitch quality. The quality of stitches are absolutely great on both machines. I would rate the stitch quality of Janome 2212 slightly higher than that of Brother CS6000i, but the lack of variety handicaps the Janome machine. The motor of Janome machine is slightly more powerful than the Brother’s, but you won’t feel the difference (It is that small). As far as ease of use is concerned, the Brother machine is a class above. It’s automatic needle threader, top drop-in bobbin and needle position button makes a lot of difference for a beginner (trust me). When you compare the machines, it is pretty evident that Brother CS6000i has the best overall package. It has the quality, features and it is affordable. That is the reason why it became the best selling beginners machine in the whole of US. If you ask me, I would recommend Brother CS6000i over Janome 2212, because you are getting so much more for more or less the same price. You will outgrow Janome 2212 rather quickly, there aren’t many user friendly features to excite a beginner. Janome 2212 will suit those sewers, who don’t want a lot of features and are happy with the 12 stitches it has. 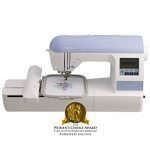 Janome 2212 is the more durable of the two and there are no electronic parts to stop functioning. The machine has its limitations, but it performs well within those limitations.